Purpose: Use this document as a reference for how to add a transaction to a student’s account in ctcLink. Enter or lookup and select the Account Type. Enter or lookup and select the Item Type number. Enter an Amount for the item type. The reference number field is optional. This can be used to track the transaction. Enter Item Effective Date on which the transaction becomes active. The default is the current date. 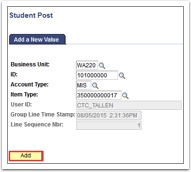 Click the Post button to add the transaction to the student’s account. Click the Student Accounts link to verify the item type posted to the account. 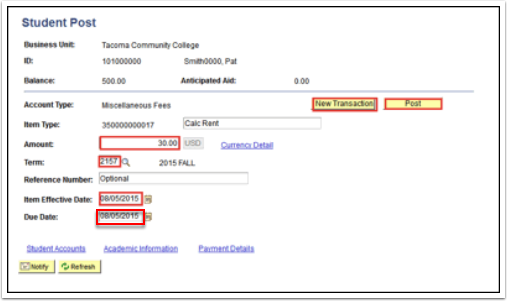 Click the New Transaction button to post a new transaction on the next student’s account. The Due Date is needed for downstream processes, for example collections processing.